Francium atoms have 87 electrons and the shell structure is 2.8.18.32.18.8.1. The ground state electronic configuration of neutral francium is [Rn].7s1 and the term symbol of francium is 2S1/2. Francium: description Your user agent does not support the HTML5 Audio element. Francium occurs as a result of α disintegration of actinium. 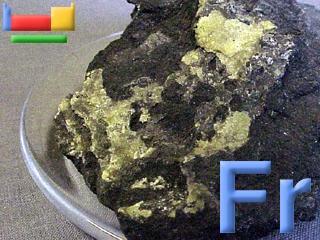 Francium is found in uranium minerals, and can be made artificially by bombarding thorium with protons. It is the most unstable of the first 101 elements. The longest lived isotope, 223Fr, a daughter of 227Ac, has a half-life of 22 minutes. 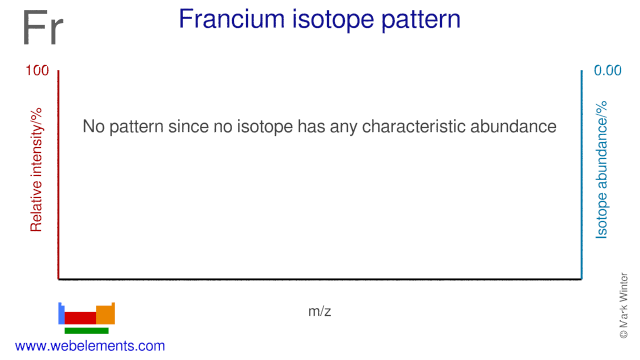 This is the only isotope of francium occurring in nature, but at most there is only 20-30 g of the element present in the earth's crust at any one time. No weighable quantity of the element has been prepared or isolated. There are about 20 known isotopes. This sample of uraninite contains some francium because of a steady-state decay chain. An estimate suggests there is about 10-20 grammes of francium (about 1 atom!) at any one time. Image adapted with permission from Prof James Marshall's (U. North Texas, USA) Walking Tour of the elements CD. 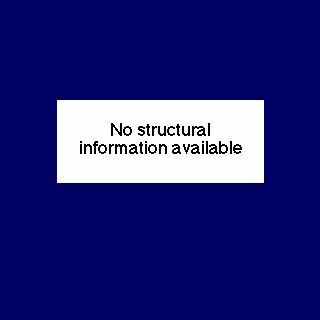 The solid state structure of francium is: bcc (body-centred cubic). Francium has no biological role. Reactions of francium as the element with air, water, halogens, acids, and bases where known. Binary compounds with halogens (known as halides), oxygen (known as oxides), hydrogen (known as hydrides), and other compounds of francium where known. Bond strengths; lattice energies of francium halides, hydrides, oxides (where known); and reduction potentials where known. Francium was discovered by Marguerite Perey in 1939 at France. Origin of name: named after "France". Isotope abundances of francium with the most intense signal set to 100%. Isolation: francium is vanishingly rare and is found only as very small traces in some uranium minerals. It has never been isolated as the pure element. As it is so radioactive, any amount formed would decompose to other elements. Actinium decays by β decay most of the time but about 1% of the decay is by α decay. The "daughter" element of this reaction, which used to be called actinium-K, is now recognized as 22387Fr - the longest-lived isotope of actinium with a half life of about 22 minutes.